Telus has a couple changes upcoming next month, set to affect users activating and renewing their wireless lines. The company will debut a new $30 connection fee, starting April 12, while also at the same time eliminating their $20 SIM card fee. While customers will no longer have to pay for a Telus SIM card, the $30 connection fee will apply. However, there is a way for customers to avoid the fee altogether—they just need to activate or renew their plans online. Rogers currently charges $9.99 for a SIM card, while Bell offers SIM cards for $0, but they come with a “one-time connection charge” of $25. No word if Rogers will follow suit and eliminate their SIM card charge, too. When it comes to fees for activating or renewing, Bell charges a one-time “connection charge” of $15, applied to a customer’s first invoice. 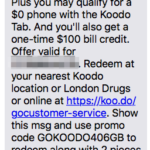 Rogers charges a $25 connection fee per device, but it is waived if customers buy a plan online. Ever since the CRTC Wireless Code forced wireless companies to unlock smartphones for free, a once steady stream of revenue has since disappeared for the ‘Big 3’. Some have argued these connection fees are there to make up for missed revenue.